The Desert Scorpion Garrison, or DSG for short, is one of Australia’s newest 501st Legion Garrisons, formerly a squad under Terror Australis Garrison. Our members have been spreading the joy of Star Wars across Western Australia since 2011 with our costumes based on the Empire and "bad guys" characters from the Star Wars universe. We are often asked what is the 501st Legion and what do we do? We are a costuming group that focuses on the ‘bad guy’ costumes of the Star Wars Universe, but the 501st and Desert Scorpion Garrison are so much more than that, we are a social group with a “fun” focus, we care for our community both local and international by using our costumes and spare time to raise money for charities, visit children in hospital and contribute to events that need that Star Wars touch. So come on in, take a look around, sign up to our forum and join in on the fun that the 501st Legion can bring you. 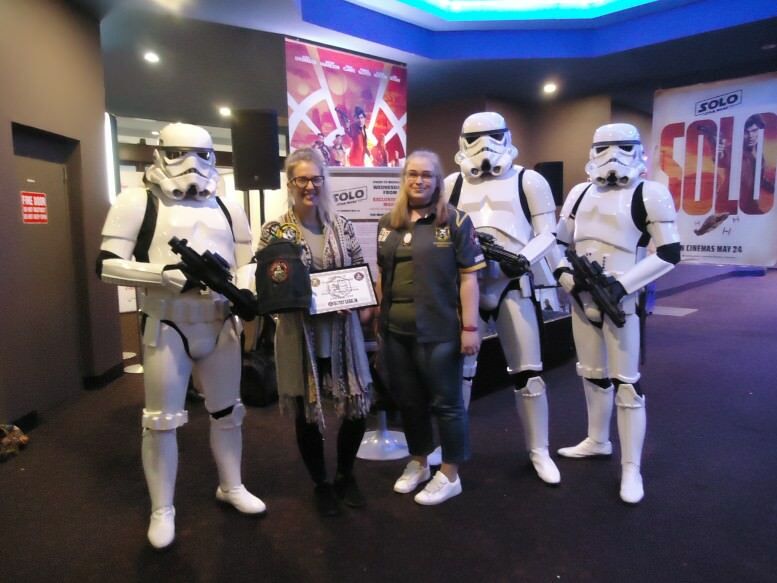 Tash or local Disney representative received the honorary membership for her work with DSG and Disney and was presented the award prior to the midnight screening of SOLO 23rd May 2018.